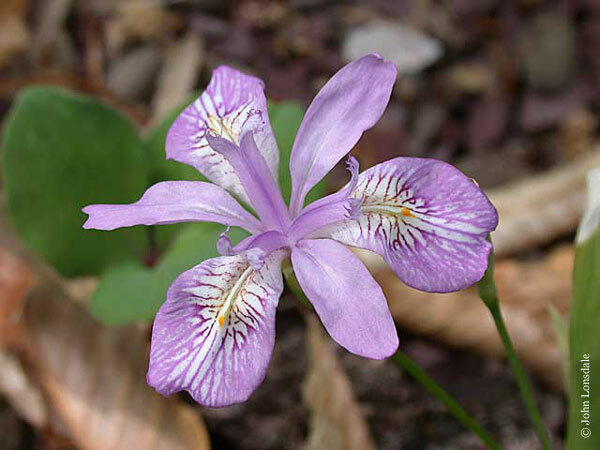 Crested Iris , a section called Lophiris in the beardless iris (Limniris) classification by Mathew, are widely distributed from southeast Asia to the United States. Species have longitudinal ridges or crests on their falls and grow from rhizomes. 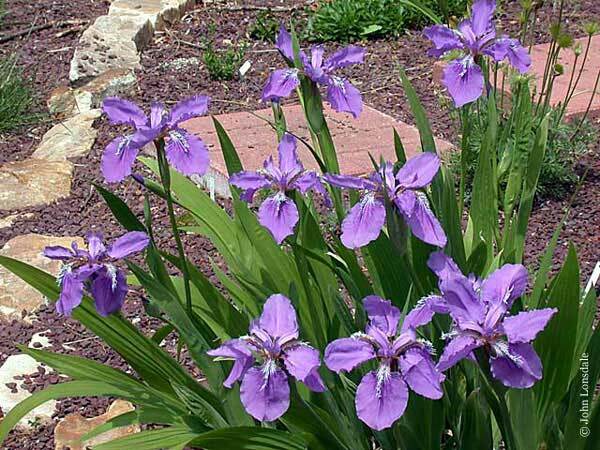 Iris confusa Sealy is from southwestern China and is similar to Iris japonica and Iris wattii. It is larger than I. japonica in all parts, but is very similar. At bloom it forms a stem beneath the fan of foliage that can reach 2 ft from the ground to the base of the foliage. 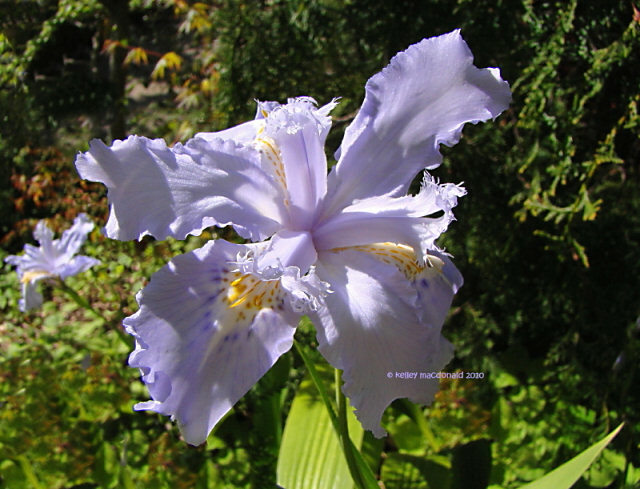 Flowers are similar to Iris japonica in pale blue or near white. 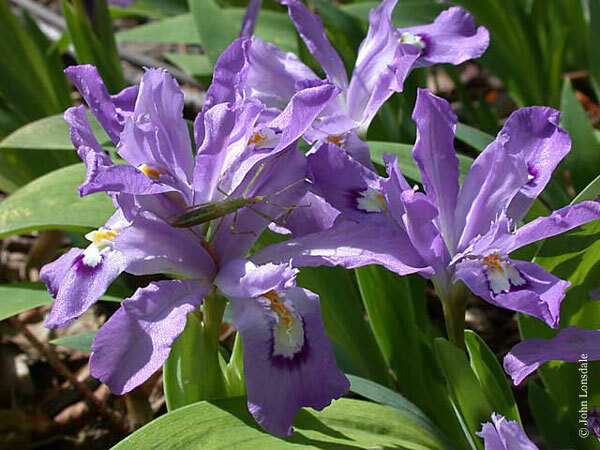 Iris cristata - hardly needs an introduction, but this eastern American Iris is a great favorite for woodland conditions. It's available in many named forms; all are lovely. I grow mine in full blazing sun, and I find I get better flowering in full sun, to no adverse effect. What I grow is the regular species. Photos by Mark McDonough. Photos below (with the names written under the thumbnails) by John Lonsdale illustrate some of the cultivars. 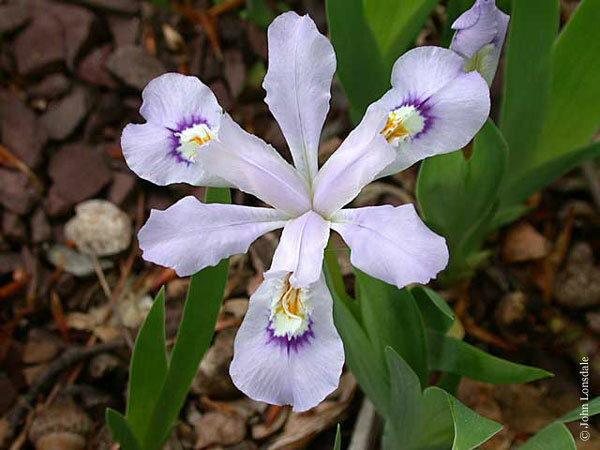 Iris gracilipes Gray from Japan and China has lilac-blue or white flowers veined violet. Photos by John Lonsdale. 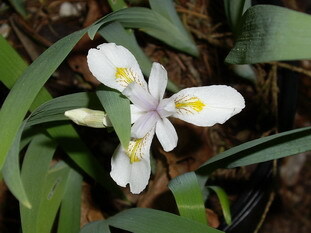 Iris gracilipes var. alba Buko form This is a dwarf form found on Buko San (mountain) in Japan, growing about half the size as the regular form, this form reaching 4-5" in flower. There is a long succession of delicate white flowers on thin pedicels from late May to mid June. Photo by Mark McDonough. 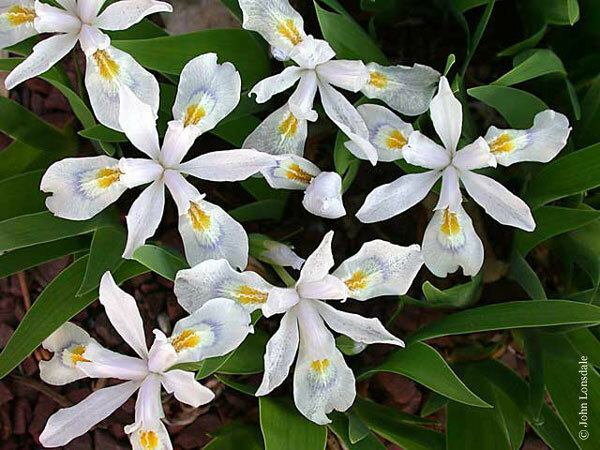 Iris japonica , native to Japan, is very common in cultivation and seen as both nearly all white or pale blue color forms. 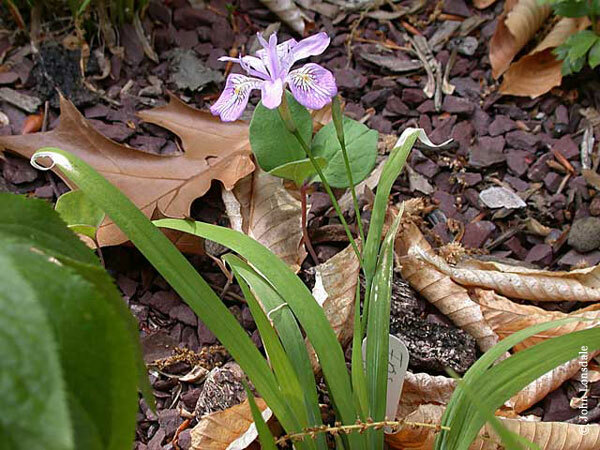 The foliage is semi-glossy and forms fans without any visible stem. There are many thin wiry rhizomes that can produce new fans a distance from the main plant. Usually the entire plant (less flower spike) is a foot + in height. 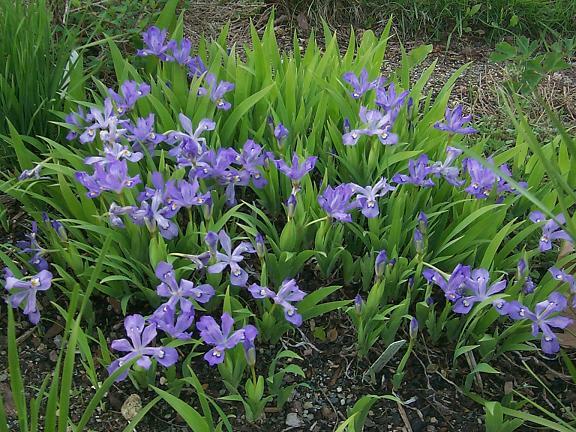 Iris japonica is similar to Iris confusa, but the leaves are at ground level. 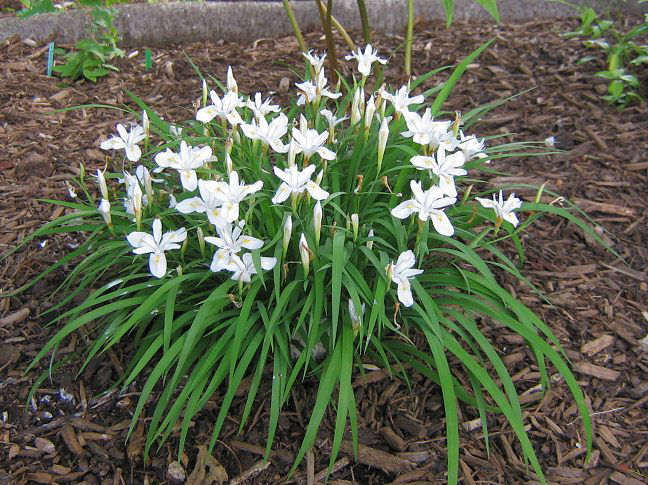 It is very easy to grow in a Mediterranean climate with very little water in summer and poor soil as well. 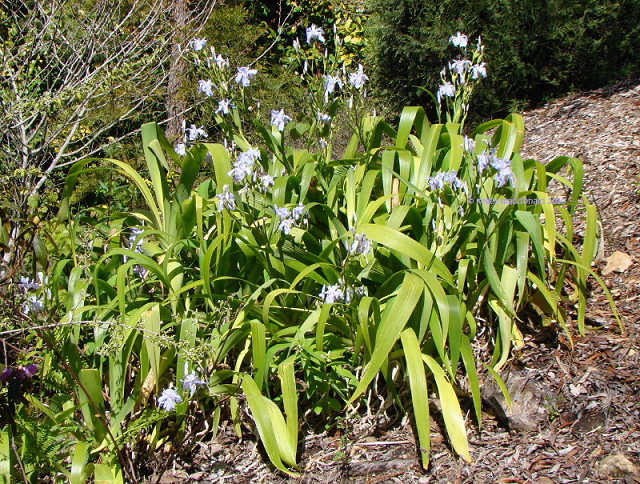 Although it is reported to be best in shade, in my Northern California coastal garden it may bloom a bit better in sunnier spots. Photos by Mary Sue Ittner. 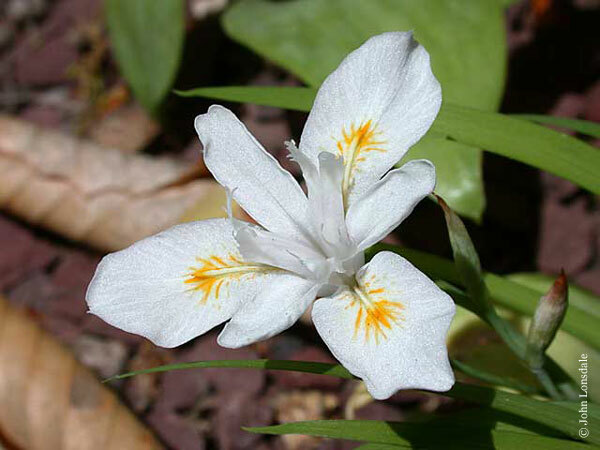 Iris lacustris Nutt. is from the Great Lakes region of the United States. 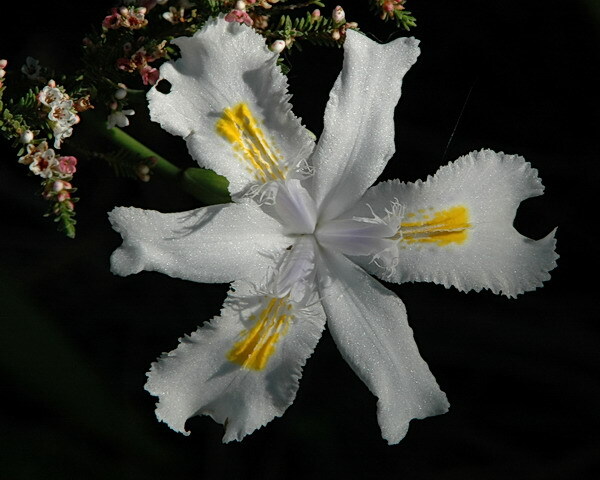 It has lavender-blue, rarely white flowers, with gold crests and a white patch. 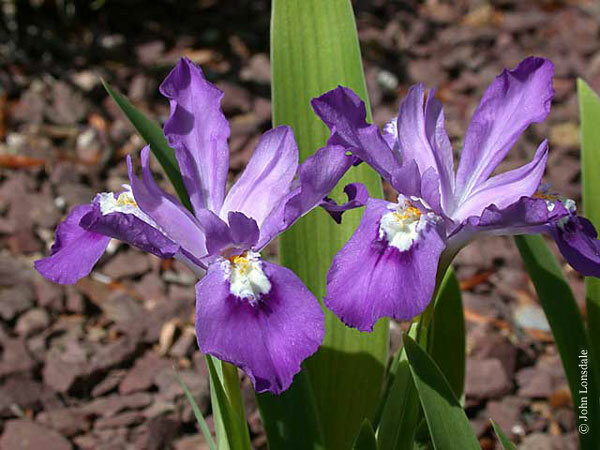 Iris 'Nada' - J.N. Giridlian of California hybridized I. confusa and I. japonica in 1936. 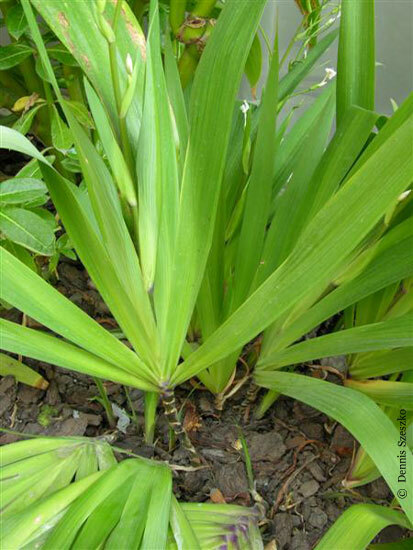 The plant grows about 18 inches tall and the flower spike can reach to about 24 inches. Although each flower only lasts about two days, the entire spike will remain in bloom for over a month as new flowers open to replace spent blooms. 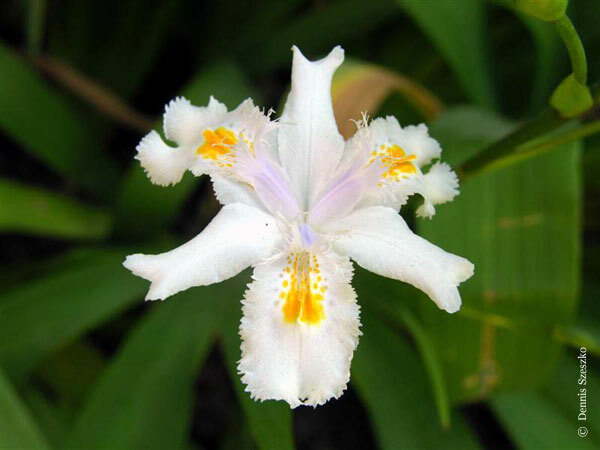 It is very floriferous and each spike will produce about 25-50 flowers. The plant seems to enjoy growing in the shade in rich soil. It has never set seed for me, so it may be a sterile polyploid. However, this is not an obstacle for propagation as it easily spreads via underground rhizomes. Luckily, it doesn't seem to be overly weedy or aggressive. (note the small fans of leaves popping up around the base of the mother plant in the second picture) Pictures taken on January 15th in Mexico City at 7,500 ft by Dennis Szeszko. 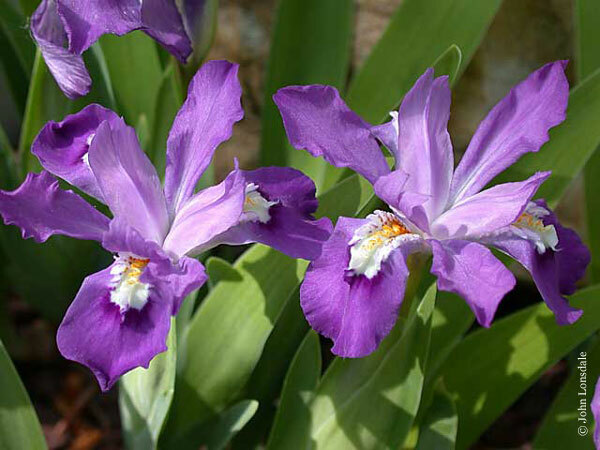 Iris tectorum is from central and southwesten China, Burma and Korea. 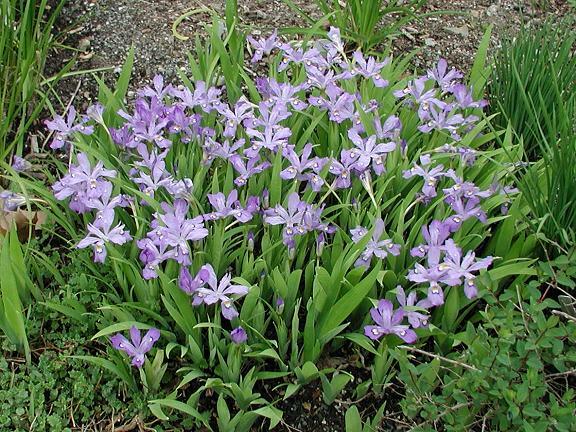 It is widely adaptable and may grow in shade and sun in a variety of climates. Seen in a nursery blooming in early May in Santa Rosa, California. Photos by Jana Ulmer and John Lonsdale. 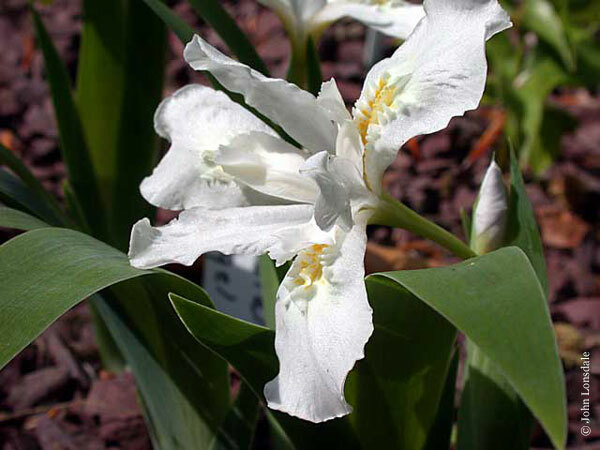 Iris tenuis Watson is the only crested iris species in western North America. 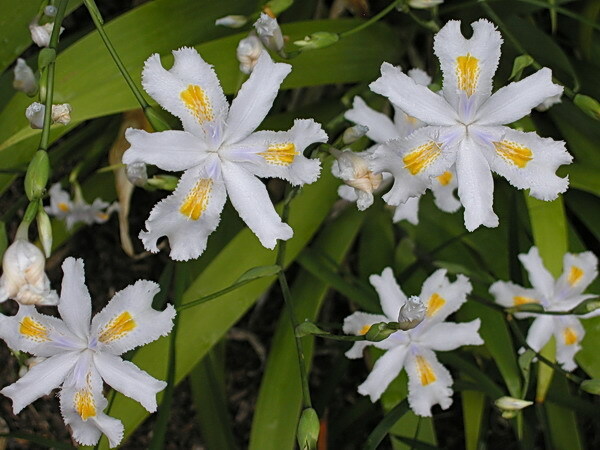 It has white or blue flowers with golden crests, grows to 30-35 cm (12-14") and blooms in May. It is native to cool duff in the Douglas-fir (Pseudotsuga menziesii) forests of Clackamas County, Oregon, on the border with Washington State. 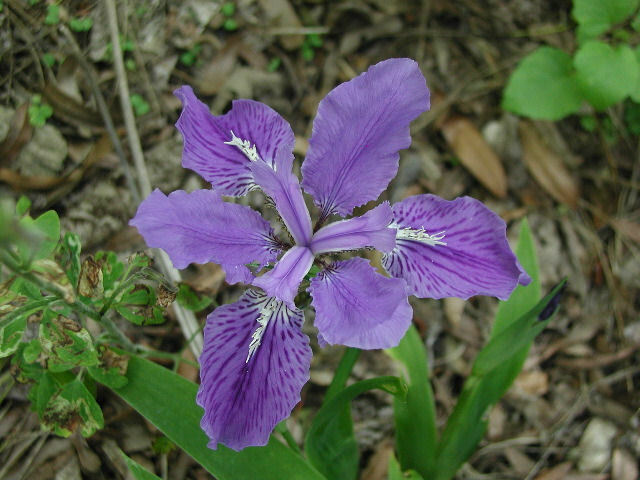 This iris needs at least part-day sun to bloom. Photo from Paige Woodward. 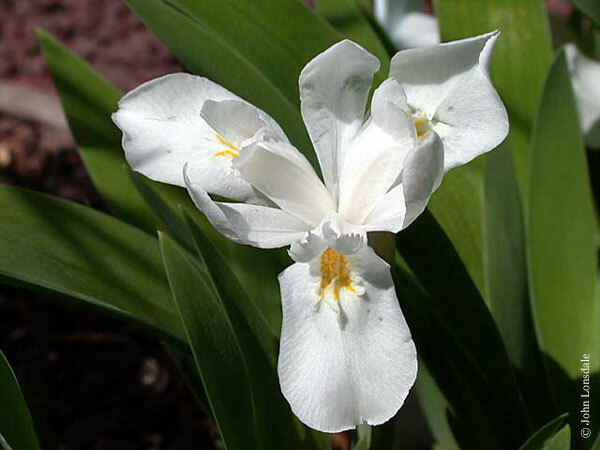 Iris wattii Baker is native to Tibet and China and like Iris confusa is sometimes called bamboo iris because its leaf fans are at the ends of bamboo like stems. 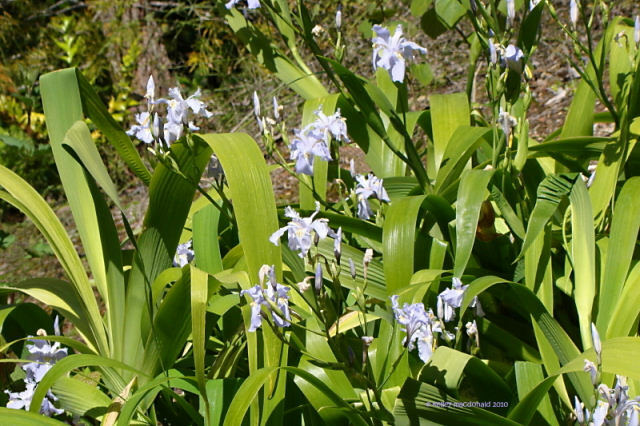 It is larger than Iris confusa; the stem is both taller and larger in diameter, the foliage is larger too and the whole plant can easily reach 6 feet or more. Flowers are violet and the crest is white, spotted orange-yellow. Flowers are up to 3 inches in diameter. 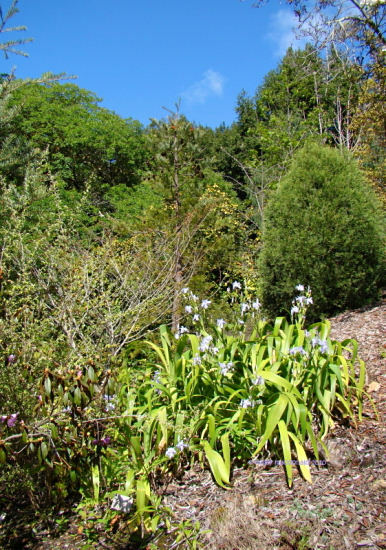 Photos taken by Kelley Macdonald in the UC Botanical Garden. 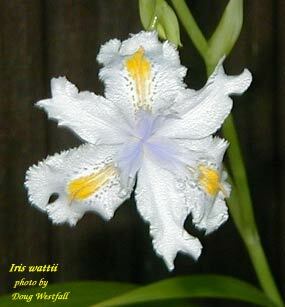 This Iris was marked Iris wattii, but may be Iris japonica or Iris confusa instead. Photo by Doug Westfall.